The British Museum is huge. You’d probably have to live in London to see the whole thing. Even then, I wonder if anyone ever feels like they saw everything the museum has to offer. We were members for just shy a year and we tried to see as much as we could in the time we had. With the museum about 45 minutes away by train, we did pretty well. But I’m sure we could have discovered more unexplored areas. Our final trip to the British Museum was a bit of a rush. Our days left in England were dwindling and we had to prioritize what we wanted to see. There were several large wings of the museum we had yet to visit, and we wanted to make a valiant attempt to see them all. We started with the Asian wing. We had passed it several times on our way elsewhere, but hadn’t taken time to note the displays. Honestly, there is so much in this section of the museum, I think we could visit that grand hall three more times and still find stuff we missed. Moving in one direction through this area takes you to the Chinese displays. 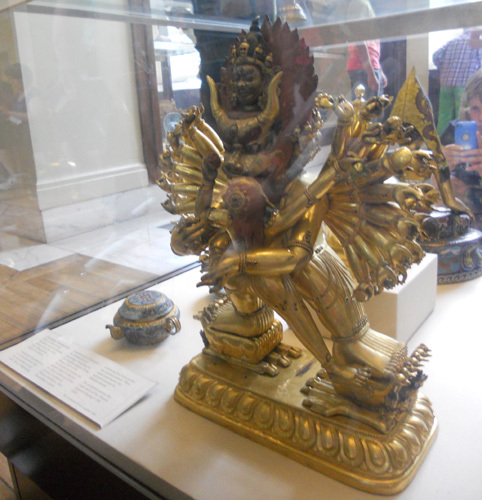 Many of these are Buddhist sculptures, but they also have finely crafted porcelain on display. 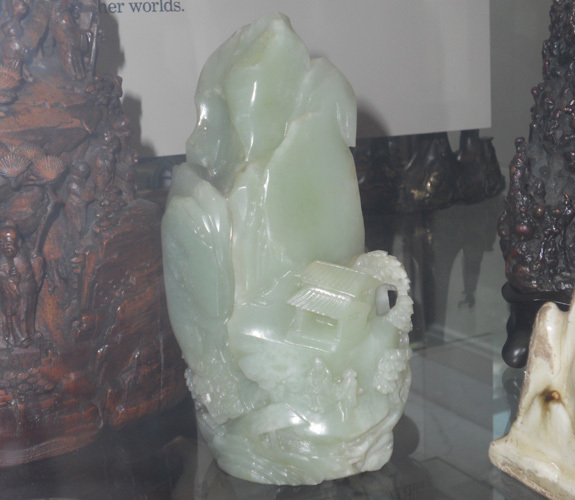 A room off to one side is devoted to jade and the role the stone played in Chinese culture, including several intricate pieces of jewelry and figures sculpted from the stone. 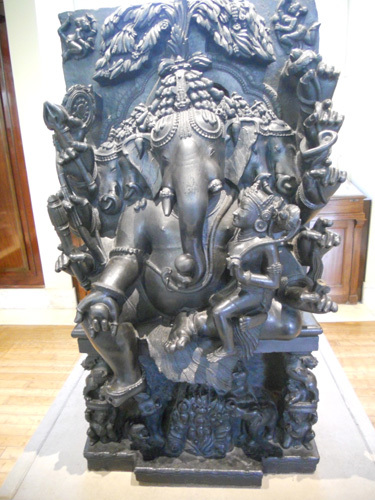 Moving in the other direction takes you through the Indian section, focusing largely on Hindu sculptures and artifacts. I love these sections of the museum because so many of the mythological figures seem alien. There are all manner of strange creatures and even the humans bear strange qualities such as extra pairs of hands or rotating faces. Someday, I’m going to have to do a proper study of Hindu mythologies. Not only are the stories rich and interesting, but every statue has several meanings, not to mention the significance of the places they were displayed. We were running low on time when we finished with the Asian section and we had to make our way quickly through the remaining exhibits. The first was devoted to Africa. 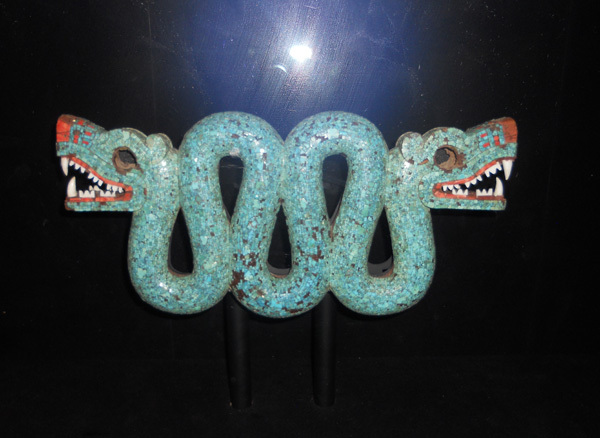 Some of the art was historical, including wood-carved statues and masks and other tribal objects of power. 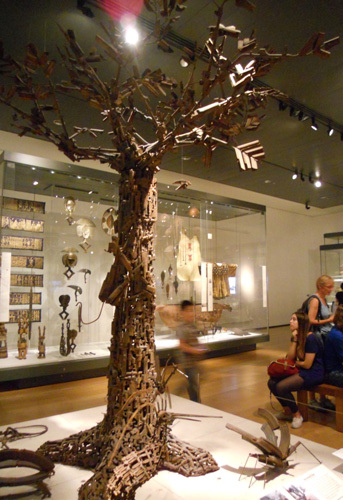 But the other half of the exhibit was dedicated to modern African art. Many African artists have reclaimed the weapons so prevalent in their nations and turned them into art installations meant to provide a clear message. With only minutes left before the museum closed, we made our way to Mexico. This section is surprisingly small, though I guess British historians didn’t study that area as much as other places. 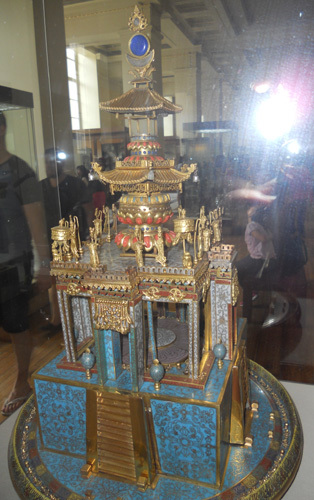 The few artifacts that they do have on display are beautifully detailed. Unfortunately a group of rowdy teenagers kept stepping too close to one of the displays, setting off the museum’s alarm system. We said our farewells to the grand halls and displays of the British Museum and passed one last time through the doors to the courtyard. We were lucky to have so much time available to visit; we didn’t have to cram our explorations into a single day. 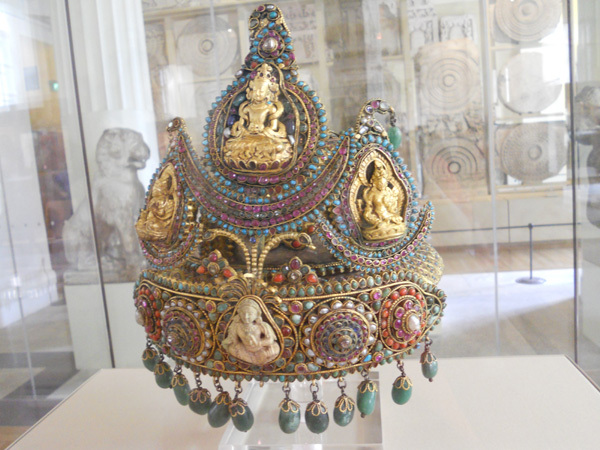 I would love to go back to England in the future and I would love to make the British Museum one of our stops.